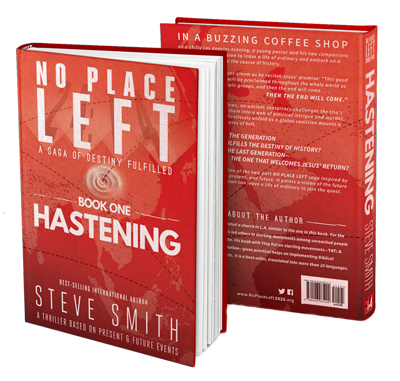 Hastening (Book One) – NoPlaceLeft2025! Suggested Donation: $10 for single copies or something less for multiple copies. Or leave the donation field blank to accept as many as you can use, as our gift to you. 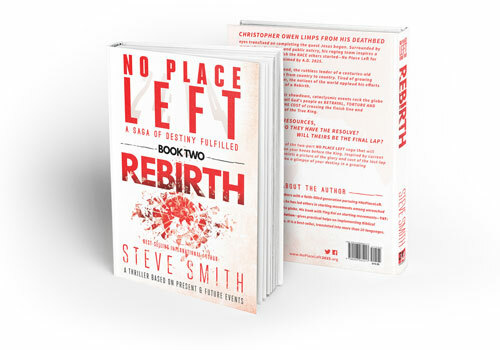 but don’t ever want cost to be a barrier to spreading Steve’s vision. Or, give according to your means, as the Lord leads you so we can continue to offer free copies to others. – Use the NOTES field during checkout to indicate the date you need your books. Arising from the shadows, an ancient conspiracy challenges the trio’s best efforts, drawing them into a web of political intrigue and murder. Apocalyptic events unfold relentlessly as a global coalition mounts a final assault on the gates of hell. THE ONE THAT WELCOMES JESUS’ RETURN?